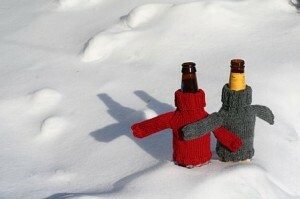 For beer lovers everywhere, these his and her beer sweaters are too cute to resist. Any DK yarn will do but Blue Sky Silk, Melange, or Sport Weight come to mind, or for those of you who like the tweedy look, a ball of Rowan Scottish Tweed would look great as well. Get the pattern free here. Halloween is just around the corner and wondered if any expert carvers out there would want to take a shot at this on your pumpkin. Click here to get the full size image. And, if you do, please send us a picture so we can post it on the blog for all to see. And, finally, this week’s special is Filatura di Crosa Puff. Was $11.95 a ball. Now 40% off at $7.17. A nicely textured yarn perfect for a warm, wooly scarf to wear while trick-or-treating. This entry was posted on Thursday, October 15th, 2009 at 2:38 pm	and is filed under Uncategorized. You can follow any responses to this entry through the RSS 2.0 feed. Both comments and pings are currently closed.